But venture off the coast and south-east of our usual territory and you’ll find a whole new slice of Africa in the shape of Madagascar. And at Africa House, that’s precisely what we did earlier this year. Sampling new destinations first-hand is essential for recommending the very finest travel encounters for our valued guests—a tough job, but someone has to do it! What we discovered was an awe-inspiring place overflowing with natural wonders. Madagascar is like a world within a single island. And what a curious new world this is. One conspicuous example of this is its abundance of baobab trees. These distinctive trees, with their baggy trunks and bundles of branches concentrated at their peaks, can reach hundreds of years old. We took the chance to stroll along the iconic Avenue of Baobabs on the far west of the island, a road where a cluster of mature trees tower overhead, creating a strikingly otherworldly scene. Madagascar also amazes with its staggering abundance of wildlife, much of it distinct from the that of mainland Africa. 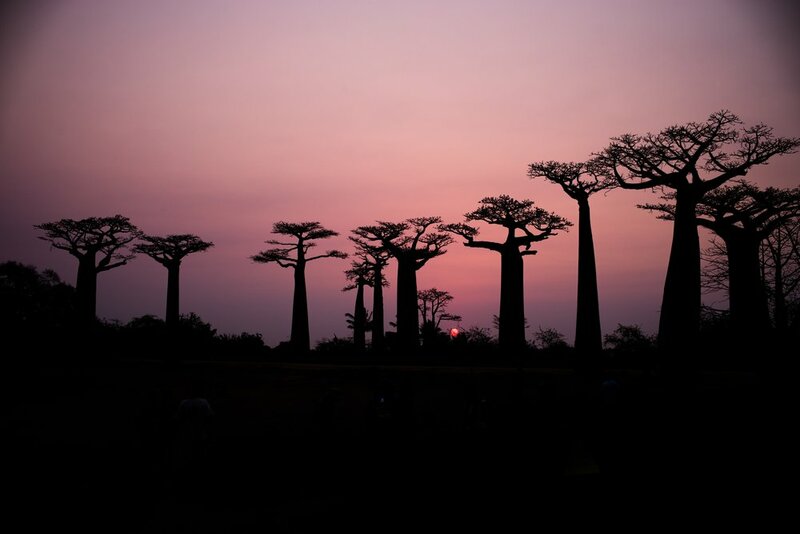 In fact, over 80% of the island’s plants and animals are found nowhere else on Earth, so to say Madagascar offers something different is a big understatement. Among the weird and wonderful fauna on display is a diverse and often bizarre variety of frogs, geckos, and chameleons. But Madagascar’s signature species has to be the lemur, a primate which is endemic to the island. We were pleased to be granted plenty of close-range encounters with these creatures, unmistakable with their wide eyes and stripy tails. And there’s even more to Madagascar than its natural delights. The capital city, Antananarivo, is an intoxicating mix of culture, history, and architecture, with the stark contrast of handsome colonial buildings and traditional clay huts adding to its charm. Plus, there are treats in store for food lovers who know where to look. We ate at La Varangue, a French restaurant in the city. What we discovered was an exceptional dining experience—delicious, accomplished dishes plus a feast for the eyes in the form of the fascinating antiques and clock collection that adorn the restaurant. Word of this gastro gem has clearly gotten out—La Varangue is one to book in advance.